Are you the Bulls number one fan? 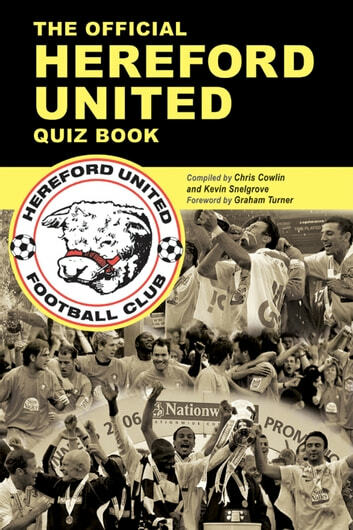 Do you consider yourself to be an expert on the history of Hereford United Football Club? Then now is the time to find out how much you really know with the 800 questions in this quiz book, some easy, some more challenging but each one certain to have you racking your brains trying to recall the events that have defined the club over the years. Everything you ever wanted to know about your favourite team can be found within these pages. There are sections on memorable managers, unforgettable players, opponents, nationalities, kit, nail-biting matches, glorious victories, disappointing defeats, final scores and much more. This tribute to Hereford United will take you from the club’s early years right up to the present time and is an invaluable reference guide as well as a fun read. It is guaranteed to provide hours of entertainment for the whole family. Packed with fascinating facts this book is certain to prove a hit with all Hereford supporters and anyone who has a keen interest in football history.